L’Aubergade Hotel World Cup Deal! One of the toughest courses in the world cup calendar, and always an amazing race : Fort William happens this weekend. To celebrate the UK Mountain Bike scene, L’Aubergade is offering a great discount for this weekend, and this weekend only! 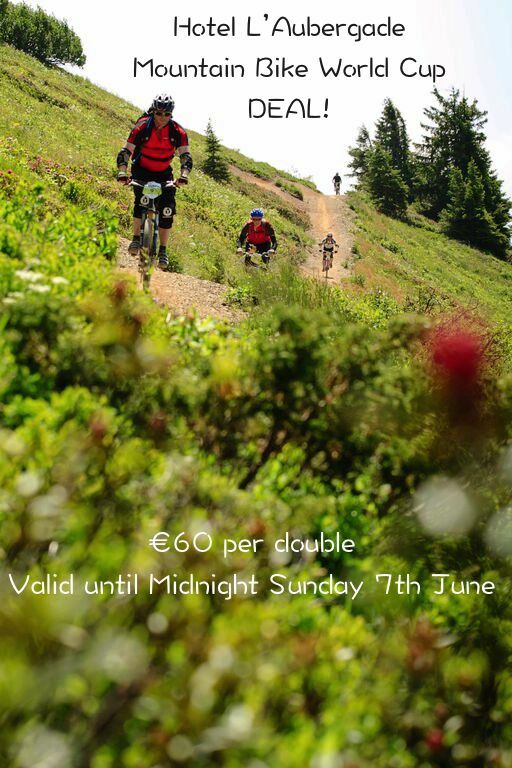 Instead of €80 per double, L’Aubergades World Cup Deal is offering a double at any date this summer season for just €60! This offer lasts until MIDNIGHT on Sunday 7th June. Visit http://laubergade.com/en/contact-us.html to book your place now. L’Aubergade Hotel is one of Morzine’s most popular accommodations. Ride from the Pleney trails to the door and enjoy a cold beer at the bar. L’Aubergade has weekly events from BBQs to Music to film nights and an amazing Sunday Roast! The rooms have a great view, and even better mattresses for the best experience after a good day on the hill. Contact Laura quoting ‘Mountain Bike World Cup Madness’ to receive this offer. Again it is only valid until Midnight on Sunday evening!